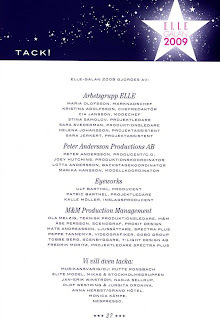 Elle awarded 13 categories, and celebrated these fantastic winners with a party at Stockholm’s Grand Hotel. It all started with a thought to notice and light up Swedish designers who work with fashion. Photographers, stylists, hair & makeup, designers. To get together all these fashion people at a large party. 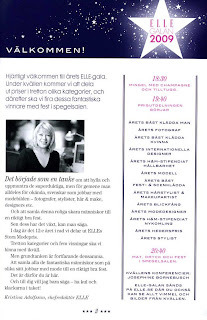 This is the 12th year of ELLE-gala ever arranged in Sweden. It has grown large since the start. 13 categories, and 5 fashion shows during one party evening. But the basic ideá is the same. To collect these fantastic people, who work hard with fashion for a large party. That is what you will see in a picture collection we put together for you here, have fun and enjoy! Wonderful arranged gala evening as always by Micael Bindefeld AB. See you 2010 again…..